Low to Moderate level of fitness required. Join us in the early hours of the morning, as we drive to Litchfield National Park down the Stuart Highway. Your experienced driver/guide will share stories and inform you of the history of Australia's longest highway. The Litchfield Day Tour begins with a visit to the town of Batchelor. Batchelor is the gateway to Litchfield National Park. The town of Batchelor was rather baron, until it was transformed into an allied air force base, which sparked growth in population. The town was introduced to mining in 1949, with the discovery of uranium within the area. 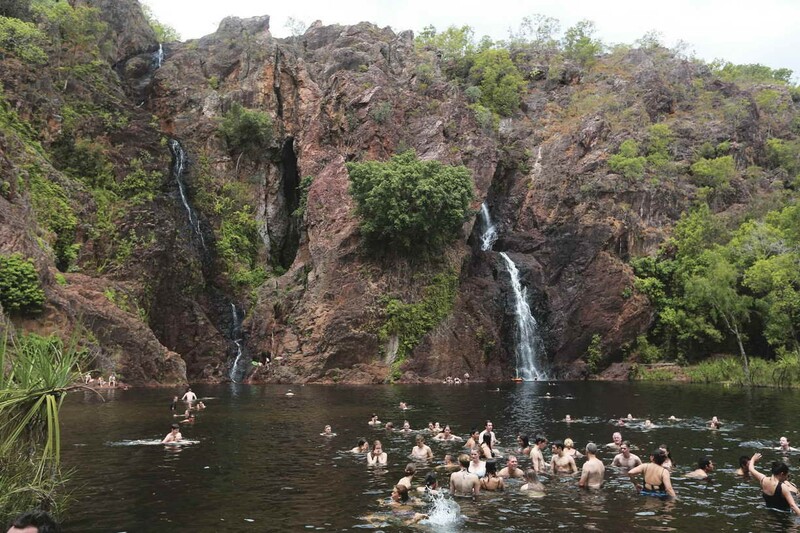 The people of Batchelor are rather friendly, and welcome visitors to Litchfield National Park. When in Batchelor, take the time to explore the local cafes and purchase a coffee or cake (At your own expense). From Batchelor, the tour continues onwards to Litchfield National Park. The National Park was established in 1986 and is one the most stunning sights you will discover throughout the Top End. 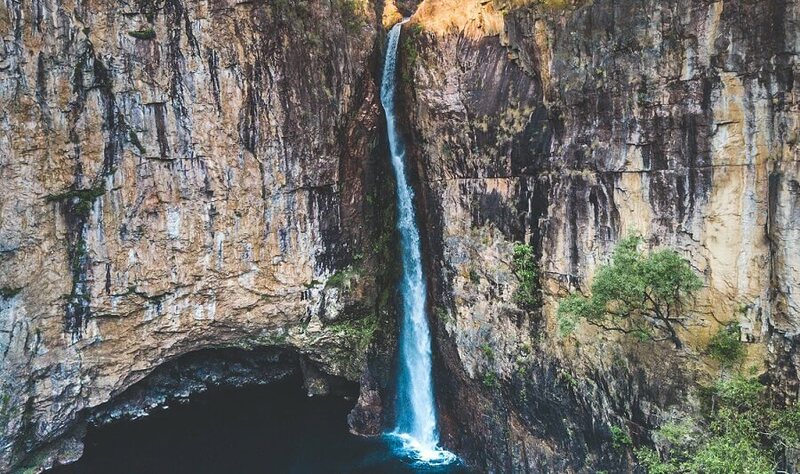 The National Park consists of crashing waterfalls, rainforests, and sacred sights which are important to the original custodians of the land, The Wagait Indigenous people. 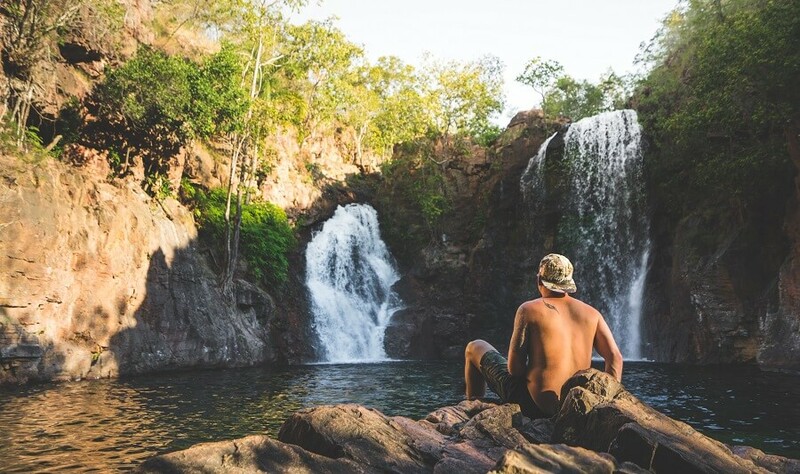 Throughout Litchfield National Park, you will experience many unique waterfalls. The first is known as Florence Falls. Florence Falls is a unique double waterfall. You can view the spectacular Florence Falls from a viewing platform, before making your way down the steps to have a dip in the breathtaking plunge pool, if you would like to cool down! Tolmer Falls is one of the three major waterfalls which can be found along the Western Tabletop Range. Bats accommodate the area, with many species of bat living in the deep cave at the base of the falls. 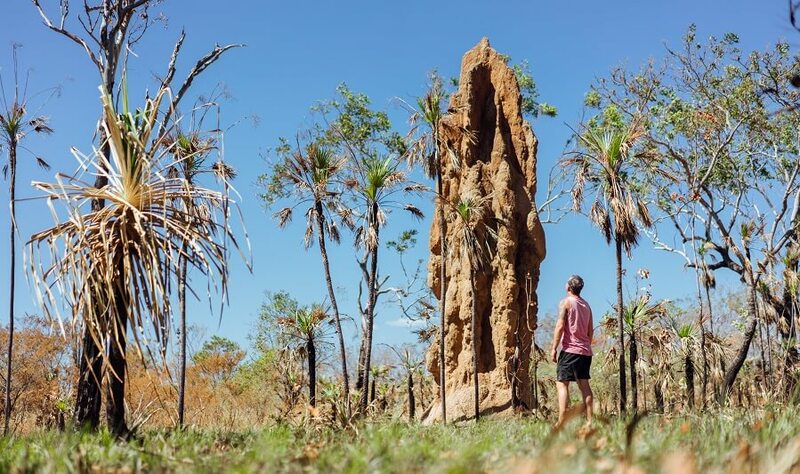 Termites are very common throughout the surroundings of Litchfield National Park. 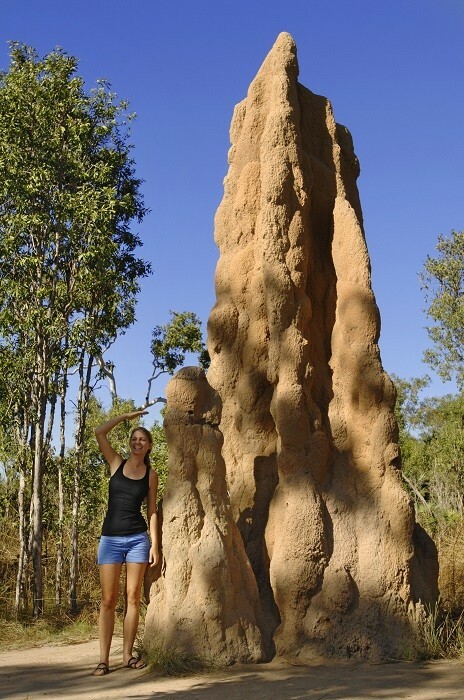 Termite Mounds can be discovered in the area, which are completed with arches, tunnels, chimneys, and nursery chambers. Your experienced guide will be able to explain the difference between Cathedral and Magnetic Mounds. To satisfy our taste buds, enjoy a delicious lunch at Litchfield Cafe. Enjoy lunch with your fellow travellers, whilst recounting the morning's events. 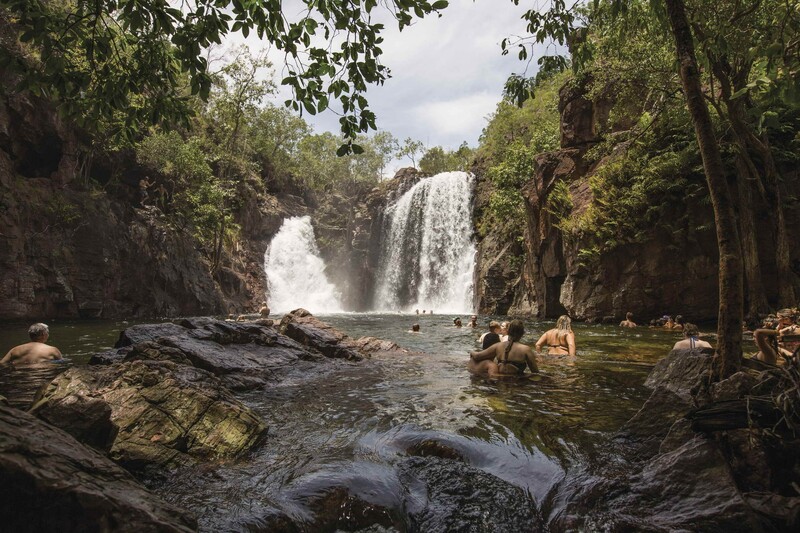 To conclude our Litchfield Day Tour, we have one last dip at Wangi Falls, which is the most accessible rock pools throughout the National Park. As we make our way back to Darwin, we call in at Howard Spring Nature Park where you can feed turtles and barramundi. 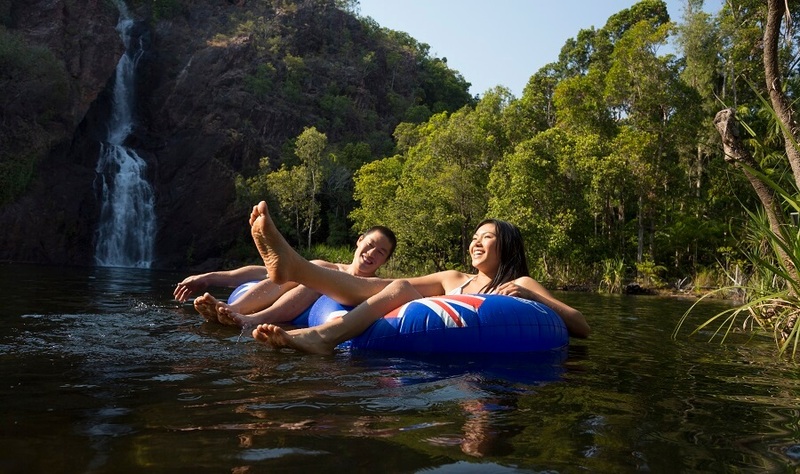 There is no better way to discover the Top End, than by joining us on our Litchfield Day Tour. Travel Australia's longest highway and discover the beauty that lies ahead at Litchfield National Park! Hotel pick-ups are available from the designated locations listed below.